The Testament of Mary opens with a quite remarkable image that captures in tableau the vision of the director, Deborah Warner, the mesmeric focus of Fiona Shaw and the inspiration of set-designer Tom Pye; Fiona Shaw’s Mary is in her most recognisable garb, portrayed as a Raphaelite Madonna, but the seemingly tranquil pose is undercut a furious muttering, is it a liturgy or is it something more, which suggests that all may not be as it seems. Shaw’s Mary presented in a Perspex box with the audience invited on stage to gawp at the figure within; this image hints not just towards Mary as one of art’s most famous faces but also towards the public spectacle of Mary as a carnival attraction, the figure of endless fascination. There is something grotesque about the scene and it is hard not to think of visitors to P.T Barnum’s famous circus. The voyeuristic aspect is brought home by the vulture that sits and watches proceedings and reflects both on the way that the acolytes would feast upon Jesus’ legacy after his death and the role that we continue to play as audience members. So begins this brilliant adaptation of Colm Tóibín’s novella that consists of a monologue from Mary reflecting upon her son and the events leading up to his death. Tóibín gives voice to Mary and presents a human relationship that deftly prizes open the centuries old fallacy presented by the Christian church of Mary as a form of virginal purity; this Mary is a mother, not just in name but also in deed. Shaw embodies this earthy, human Mary. She is raw, alive and mourning the loss of Jesus as only a mother can. There is a humour amid her grief, thick and black, as she considers the impact her son had on others. Her Mary is Irish, this is both important and unimportant; what nationality should she be? She could be from anywhere but in making her Irish Shaw finds a folksy grounding and enables access to a natural informality in dialogue that can both raise the everyday to the state of the miraculous whilst grounding the miraculous in the everyday. Running through the play is a strong feminist undercurrent that gives voice and power to the women in Jesus’ life. 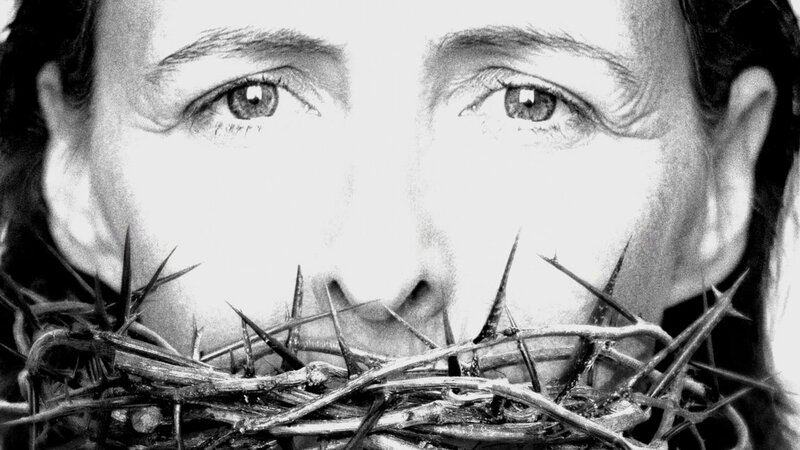 Advertising the play is an image of Mary gagged by a crown of thorns. It is a heavily symbolic image and suggests the fact that Mary, as woman and mother, is isolated in the aftermath of the crucifixion by those creating the mythology. One could argue that Shaw’s Mary is outlandishly modern but this critique seems misplaced, this is not being presented as history but as fable. Mary’s modernity is only as misplaced as the existence of miracles that she is so sceptical of. Shaw’s Mary is no true believer – time and again we are pulled back to the central mother-son dynamic and, like many mothers, she cannot bring herself to trust her son’s friends and the actions that the ascribe to him. Her outsider status gives her an angle on to the famous miracles. The Lazarus myth is skewered quite brilliantly and demonstrates the horror that might accompany bringing someone back from dead. She is able to delve into the darkness of the story and the Lazarus that returns is closer to a zombie, reduced to wandering in a near-fugue state or sitting alone halfway between one world and the next. The play excels in examining the way that myths are created out of half-truths, and the way that stories gain currency through repetition and force of will. We see, through Mary, the pressure to create a narrative that will stand through time and the understanding of those that followed Jesus of what was needed to ensure the legacy lived on. The play hints at the crucifixion becomes a necessary act – the saving of humanity’s sins is not through the act itself but in that the act allowed the myth to be built up around it. In a bleak and potent scene, we see Mary asked to give credence to a story of her actions at her own son’s death. We have been told how she had to flee for her life, how she had to steal clothes and food to survive, but already her narrative is being romanticised to present a more noble and heroic image. Fiona Shaw is phenomenal as Mary. Within the last few months London has been blessed with brilliant performances by two of the leading female actors of our generation and it is interesting to compare with Juliet Stevenson in Beckett’s Happy Days. They require very different approaches to the roles; Beckett so precisely sets the scene and the dialogue that Stevenson has far less leeway in the role creation. All that is left is to play with voice, timing and control. Her performance is fearless and the moment that she strips naked and submerges herself in water has cathartic quality. It cannot help but convey a perverse baptismal quality, a washing away not of sin but of memory. She emerges and stands proudly with cloak slung around her, a mirror image of one of the iconic images of her son. 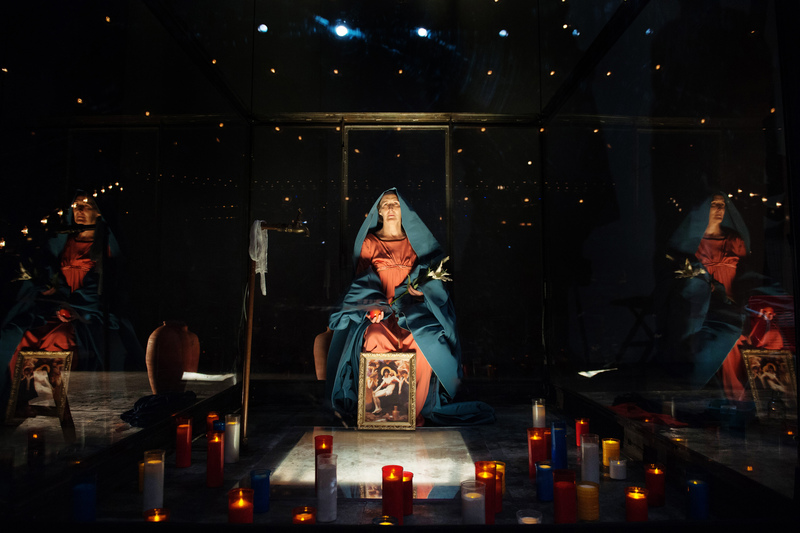 Deborah Warner’s production finds a number of notable mirrors within the play where Mary, both consciously and unconsciously, echoes her son’s crucifixion. Whilst Warner can often come across as heavy-handed, here her interventions are well-judged and it seems clear that Shaw has been given a free hand in the role’s creation. Warner restrains herself to working with Pye’s set design and Mel Mercier’s sound design; together they have created a beautiful stark set that contains necessary clutter without ever seeming busy. Underpinning the play is fuzzy, discordant music that should feel at odds with the play’s historical nature but actually works to support the disorientating effect of the unfamiliar take on the familiar narrative. There is nothing that can be faulted with the play; it is quite outstanding and quite brilliant. For 80 minutes the audience is totally absorbed, never rushed and never less than alert. Shaw has produced an exceptional portrait of one of the most famous figures in history and allows us to see the universal and the personal. Shaw breathes life into Mary and in doing so creates someone far more alive than in the hundreds of thousands images that have been dedicated to her.